The miniature German shepherd is a designer breed that can function both as a household pet and as a working dog. It is a good looking and powerful breed. In this blog post, we shall cover its lineage, its temperament, maintenance schedule as well as health concerns. 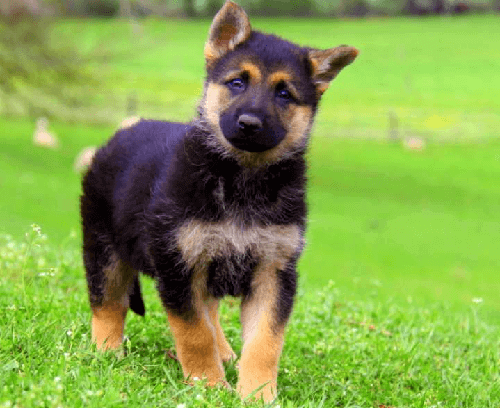 What is the miniature German shepherd? This is a question that confuses many would be dog buyers. Is it a smaller version of the purebred German shepherd or is it a whole different breed? If you have been plagued by this question in the past, then worry no more, we address it in this article. The miniature German shepherd is an adorable designer dog that is the result of cross-breeding the German shepherd (Alsatian) and a smaller dog breed. The smaller breed is usually the poodle or the collie, but in rare cases, some breeders prefer to use Yorkshire Terriers. 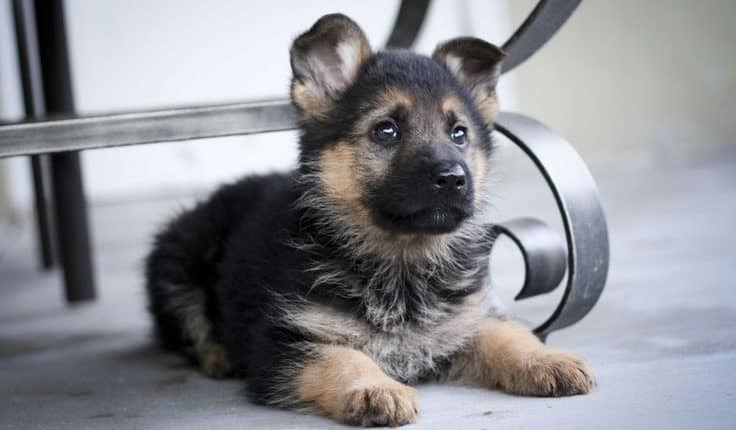 It is important to note that sometimes, what might look like a miniature German shepherd is actually a purebred German shepherd that suffers from dwarfism. 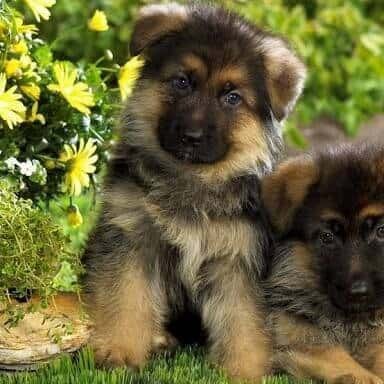 The reason for the confusion is because unscrupulous breeders have learned that they might sell a miniature German shepherd more expensively if they try to pass it off as a smaller version of the popular purebred Alsatian. Now that we understand what the miniature German shepherd is, let us take a look at what it looks like. From its highly descriptive name, and the common confusion with German shepherds that suffer from dwarfism, it is clear to say that the miniature German shepherd looks like a smaller version of the Alsatian. It is a crossbreed between the Alsatian and another dog breed, sometimes a miniature German shepherd might pick some physical characteristics from its non-Alsatian parent. Don’t let its cuteness deceive you. The miniature German shepherd is a powerful and physically impressive dog breed. It has strong straight legs and a powerful physique, making it the perfect mix of cuteness and athleticism. One of the key physical differences between the miniature German shepherd and a German shepherd with dwarfism is the proportion of the physical features. 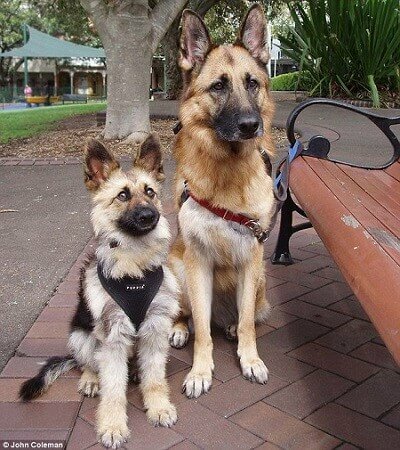 The miniature German shepherd is ‘perfectly’ proportioned while on the Alsatian suffering from dwarfism, there might be a size mismatch between the head and body sizes. There is no reason why you shouldn’t get an Alsatian that suffers from dwarfism. It comes with significant needs in terms of vet care that might be challenging for households working with tighter budgets. With a coat of soft hair, grooming is easy with a few strokes using a simple brush. Unless your dog spends most of its time outdoors, you might need to brush its coats a few times every month. Exercise is the most important aspect of maintaining a miniature German shepherd. These are athletic animals full of energy. Take your dog for one long walk every day to ensure it maintains a healthy way of life. Miniature German shepherds can also stay in a wide variety of weather conditions. They are very hardy and can withstand both warm and cold climates. As with all animals, you should ensure that your dog has regular visits to the vet for health checkups. Their feeding schedules are also not very demanding. Temperament is an important quality to consider when getting any pet; especially if you are living with children in the home. 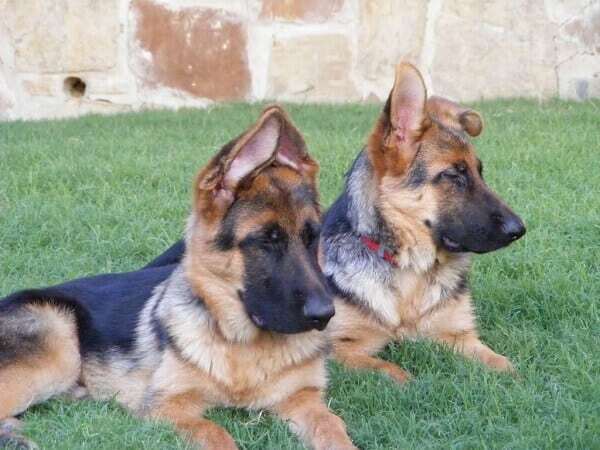 The German shepherd is one of the most popular dog breeds in the world, thanks to the pleasant temperament that it has. Alsatians are known to be intelligent dogs which pick up training much faster than other breeds. They are also very disciplined and are fiercely loyal. When you have a German shepherd, you have a companion and a protector all rolled into one package. The miniature German shepherd picks up most of these characteristics from its German shepherd parent. Miniature German shepherds are quick learners and are very obedient once they are trained. Its most endearing quality is the willingness to please its owner(s). They form very strong emotional bonds with their families and they are very energetic. However, a common disclaimer that is given to anyone who is getting a crossbreed is that sometimes your dog might pick up some undesirable characteristics from its other parent. Never rush when getting a dog. Take a few days to observe how it interacts with other animals at your breeder to determine if its character traits are a good suit for you and your family. Do Miniature German Shepherds make good pets? The purebred Alsatian is much larger, which makes it a difficult pet to own if you are living in a smaller home. This is not an issue with the miniature German shepherd. While they do need space to express themselves, a regular 1-bedroomed apartment can be sufficient space for a miniature German shepherd. Another key reason for their suitability as pets is the bonds that they form with their owners and their families. If you have children, then there is no better companion than a miniature German shepherd. They are adorable, loyal, and protective and physically active which should keep your kids physically engaged during hour-long sessions of play. Most importantly, for a household pet, the miniature German shepherd is a very easy animal to train. They are very receptive to commands and can be easily house trained within a short period of time. Is the Miniature German shepherd a working dog? Interestingly, despite the miniature German shepherd being a ‘designer’ dog that is perfect for a pet, it can still be utilized as a working dog. The German shepherd gained its name, and its immense popularity, due to its suitability as a working dog. These traits have been passed down to the miniature German shepherd. It can be used in a farm setting as a sheep herding dog, much like its parent breed. This is due to its stamina, discipline, and loyalty. Apart from its shepherding credentials, the miniature German shepherd can also be used as a guard dog. Other work settings where the miniature German shepherd is perfect for includes being used as a guide dog or as a search and rescue dog. If you are planning to use it as a working dog, then you need to note that it has an inherent playfulness that needs to be indulged. Make sure that you schedule enough time for play during the dog’s day to keep it happy and focused on its tasks. Health Concerns associated with the Mini German shepherd. Any crossbreed dog is susceptible to the health conditions that their parent breeds are predisposed to. Since there are numerous breeds that can be crossed with the German shepherd to make the mini German shepherd, we should analyze the health concerns depending on the individual breeds that can be crossed with the German shepherd. 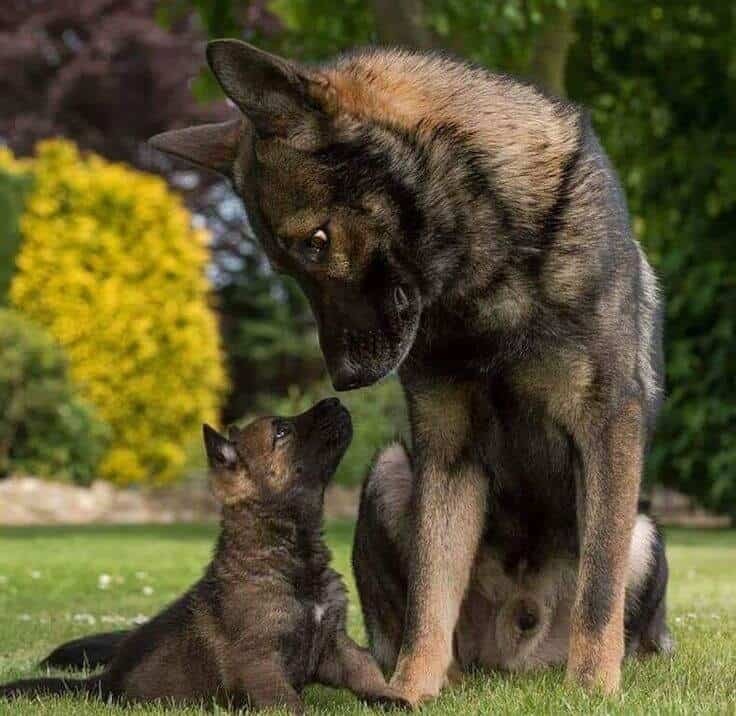 The German shepherd is the ‘dominant’ parent breed, which means that all miniature German Shepherds are susceptible to the genetic problems that are common within the German shepherd breed. A. Hip Dysplasia: This is the number one health problem that German shepherds are genetically predisposed to. It is caused by the malformation of the hip joint at birth. B. Degenerative Myelopathy: This is a neural disease that results in the degeneration of the spinal cord and other parts of the nervous system. C. Endocrine Pancreatic Insufficiency (EPI): This is a digestive disorder that can be easily treated if diagnosed early. If it goes undetected, it can have fatal outcomes for your dog. One of the main crossbreeds for miniature German shepherds is the German shepherd-poodle mix. A condition that causes sudden unconsciousness in your dog. This is a condition that is caused by insufficient production of thyroid hormones. It results in a weakened immunity, and in most cases, hair loss. This is a condition that results in the partial or complete blindness of poodles. The German shepherd-collie crossbreed is the other most common variation of the miniature German shepherd. This is a gastrointestinal problem that can result in fatal outcomes if undetected in time. This results in the partial or complete blindness of collies, and their derivative breeds. Given sufficient time to diagnose and prepare, most of these conditions are treatable. What this guide has taught us is that in terms of versatility, there are fewer better dogs to own than the miniature German shepherd. Since it is much smaller than the purebred Alsatian, you can stay with it as a pet if you have an apartment without any yard space. Not only does its intelligence and temperament make it a good family pet, its athleticism and discipline mean that it can also adequately serve as a working dog. 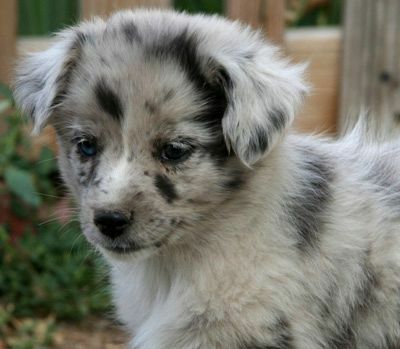 Your only concern are the medical complications this breed’s parents have a history of. Ensure that you get a full DNA profile from your vendor, and get your vet to do a medical checkup on some of the more common medical conditions before committing to owning a miniature German shepherd. Is there a link to a breeder/place where one can find a miniature German shepherd for sale?